I haven't read too many autobiographical novels in my time and out of the ones I have read none of them have made an impact on me as grave as this book. I went looking for an autobiographical novel just for this blog post and I found a brilliant book. Firstly the author. Such brilliance. She somehow manages to turn black and white words into emotions filled with colour (no pun intended) and exposes the shades of grey. 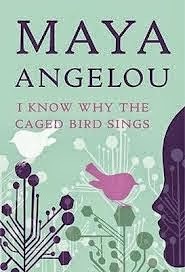 In this book Maya Angelou describes her life as a child till the birth of her first child at the age of 16. Something that makes the book better is its sad reality. The fact that these events actually happened with the author makes you admire her more for her strength during those difficult times. The author’s mother had recently got divorced, she was three years old. She and her brother were sent to live with her grandmother who although did not treat them with too much love and made them work hard, instilled values in them and gave them a home. This part of the book is described in detail. She talks about the surrounding, the food and the treatment people of her colour of skin got in that time and some of it is just shocking. After about 5 years, they moved to live with their mother and that is when the real tough times set in. Although they loved their mother and admired her, the turn of events changed their lives forever. Maya was raped by her mother’s boyfriend. At any age this is undoubtedly a horrific experience and it traumatised her all the more as she was just a child. She was placed on the witness stand in court but was shaken up by the threats the boyfriend made towards killing her brother if she dared to say anything. Fortunately for her, this problem was solved as the perpetrator was killed soon after. The children were taken away from their mother and placed in the foster system where they jumped from one house to another all their childhood lives. Unfortunately, the children never got the childhood they deserved and were ripped of their innocence too early in life. Maya Angelou is bluntly honest about all the problems she faced in her life including violence, sexual abuse, conflict and an unwanted pregnancy. She is hard in her manner of speaking and sometimes sounds bitter about her experiences. She also shows strength by deciding to write the book in the first place as a autobiography and by relating real events and reliving those appalling times again. The best part of the book is that she doesn't only talk about the bad times; she talks about the silver linings, the good times too. I really value that because after all that she has been through I can only imagine how difficult it is to remember the silver linings and appreciate life in general. I also came across an article that talks about the book being banned for being too explicit, but my opinion on that is that her life was too explicit. She went through things that nobody should ever have to go through, obviously its not all rainbows and unicorns! I mean for God’s sake, I think if this is the criteria that they take into consideration while banning books, I think I’m going to go pick up a few more ‘banned’ books. This book talks about survival against all odds. This book talks about strength. This book is a must read.